Learn with Lee: Real Estate Coaching and Consulting: 3 Hacks to Boost Your Social Media Presence in Less Than 10 Minutes a Day! 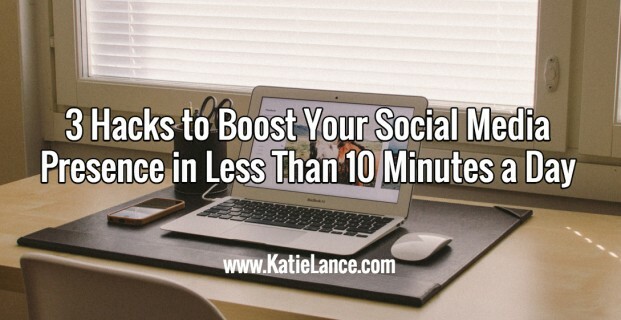 3 Hacks to Boost Your Social Media Presence in Less Than 10 Minutes a Day! By Lee Davenport as originally written for and featured on KatieLance.com. S-O-C-I-A-L M-E-D-I-A! If you are like me, you have a love/hate relationship with it. You love social media because it has allowed you to connect with many that may have fallen by the wayside, whether friends, family or potential clients. But you may hate that it is a drain on your fleeting time, especially as you hustle to strike a balance between real estate and your personal life. Today I want to share some tips and tools to help you boost your social media presence (engagement with relevant content is still the name of the social media game) in less than 10 minutes a day (yes, in LESS THAN 10 minutes) so you can reclaim more of your time for face-to-face interactions, whether you are showing homes, attending a closing, hosting an open house or going to your nephew’s first solo performance. Best of all, many of the tools are FREE. If you are like me, you may find yourself feeling like a “broken record player” or a track on constant repeat (for my fellow Millennials) when it comes to explaining certain nuances of the real estate process to your clients. If your specialty is working with first-time buyers, you may find yourself sending various texts and emails and making calls to reiterate the importance of NOT making any major purchases with credit prior to closing since buying a home seems to naturally spur an insatiable itch to buy a new car and new furniture but can leave a would-be buyer homeless if their credit score takes a dip from the untimely purchases. Or, maybe you have to constantly give sellers a friendly reminder to not chat with buyers when you are not present (since there can be the hopefully rare, impromptu home showing) as that will compromise their negotiating position. Well, that content will come in handy and be vital to the expansion of your social-media presence. Here’s why: typically, we agents want to work with clients in a particular neighborhood, school district, price point and the like. Once you have started working with your desired clientele, you will start to notice frequently asked questions and other patterns. Therefore,if you can start pre-empting those questions by posting the answers on social media, you have just take a huge stride in building your social media presence. What’s more is that because this is a topic you could answer in your sleep, it should take you 2-3 minutes to create an effective post that positions you as a real estate leader on social media. For example, you could pose the following question to your social media groups, followers and friends: What is the best way to avoid delays with your next home loan and purchase? Wait until after closing to finance furniture, a new car or anything over $500! Visit MyWebsite.com for more help purchasing your next home. 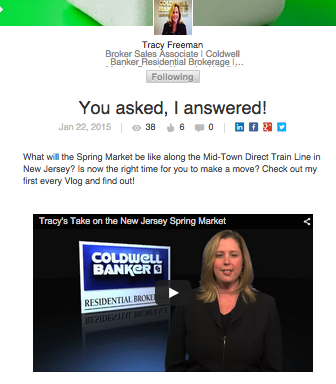 Such a post draws on your expertise, allowing you to post it in less than 3 minutes. Save even more time by jotting down questions in Evernote/Google Keep a list of interesting topics that come up throughout your day so that now you create a topic arsenal for your social media posts. Bonus: always remember to include a call to action such as visiting your website or contacting you to help you to convert social media friends and followers to actual clients. If you were in the real estate world ten years ago, I am sure you are no stranger to the acronym OPM, other people’s money. OPM represented the heyday of the real estate boom with investors buying what they could with as little of one’s own money but as much of other people’s money, whether that meant banks, investment groups, etc., as possible. Now that we have seen the error of those ways and the real estate market is finally recovering from such a flawed investment strategy, we can parlay this acronym into something that can now signify good in our industry — other people’s messages. 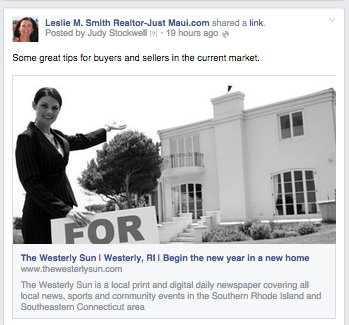 Social media is a fantastic place to have lively discussions about the hot topics in real estate. You may not have time to write a dissertation on the current state of your market, but you can re-post someone else’s piece to get a conversation going, again to show off your expertise. The key is to give credit where credit is due (don’t steal anyone’s content) and to be sure to include a call to action as mentioned before so that although you are using someone else’s content to attract eyeballs to your social stream, you are the one they engage with! 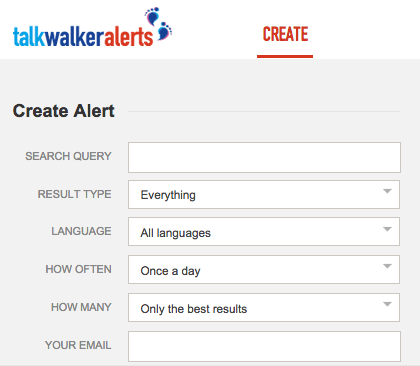 I HIGHLY recommend having the articles come to you by setting up a free Talkwalker Alert(similar to Google Alerts but better since it features alerts from social media sites as well as websites), which will email you a summary and links to articles regarding your topic of choice, whether you are focusing on school districts, new home communities, etc. Also, you can use BufferApp (this app allows you to scan relevant content topics on their site or bookmark articles around the web to your account with them through the Chrome extension and then it feeds it to your social sites on your determined schedule) orBuzzSumo (which allows you to see articles that have generated the most buzz on a topic) to find relevant content all within the 5 minutes allotted for this tip. Real estate is a people business where actual human contact matters, so we should not automate everything but there are things that can be automated when it comes to social media. The main thing that you should automate is your initial post on social media. 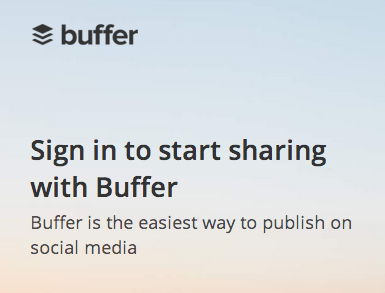 I have already mentioned BufferApp, which is great to create a schedule of what you what to post and when so that you do not have to be tethered to Facebook, Twitter, Google+ or whatever your social media site of choice is (you can plan your whole year in one sitting if you wanted). Another powerful automation tool is SumAll, which will find your most popular posts and then re-post them for Throwback Thursdays, allowing you to reach a new audience or revisit your old audience with great content for which you already have done the work (such as adding call to actions, etc.). 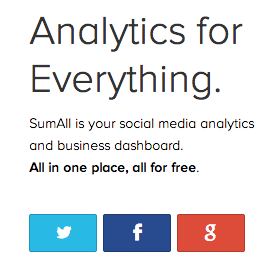 SumAll will also help you know what is working and what is not across the most popular social sites through its extensive metrics that are emailed to you daily and/or weekly (no more fumbling around and visiting 5-10 sites to find out what is going on with your various social media sites). I would be remiss to not mention Friends+Me, which is a dynamic two-fer that boosts your social media presence and Google ranking simultaneously. With this program, you can have your posts from Facebook, Twitter and several other sites automatically feed to your Google+ profile, which is paramount for ranking higher on Google. This is great if you have ever thought about getting on Google+ but did not have the energy or time to learn a new social media site. Bonus: the key to Google+ is posting your content to relevant groups (i.e. homeowners in Atlanta) to build your following and using call to actions to convert those followers into clients (more on how to do this in another post). However, if you are like me and already use Google+ to enlarge your social media following, build your email list and drive traffic to your other sites (yes, Google+ does ALL of that! ), then you may feel like Friends+Me is not for well… ME! But it is because it works in reverse too, meaning that when you post to Google+, Friends+Me can then repost your content to numerous other social media sites and can even filter them based on hashtags if you want. Wow! This has been a critical time saver for me. There you have it, folks! You can boost your social media presence in just 10 minutes a day so stop letting Facebook, Twitter and the like zap your precious time. 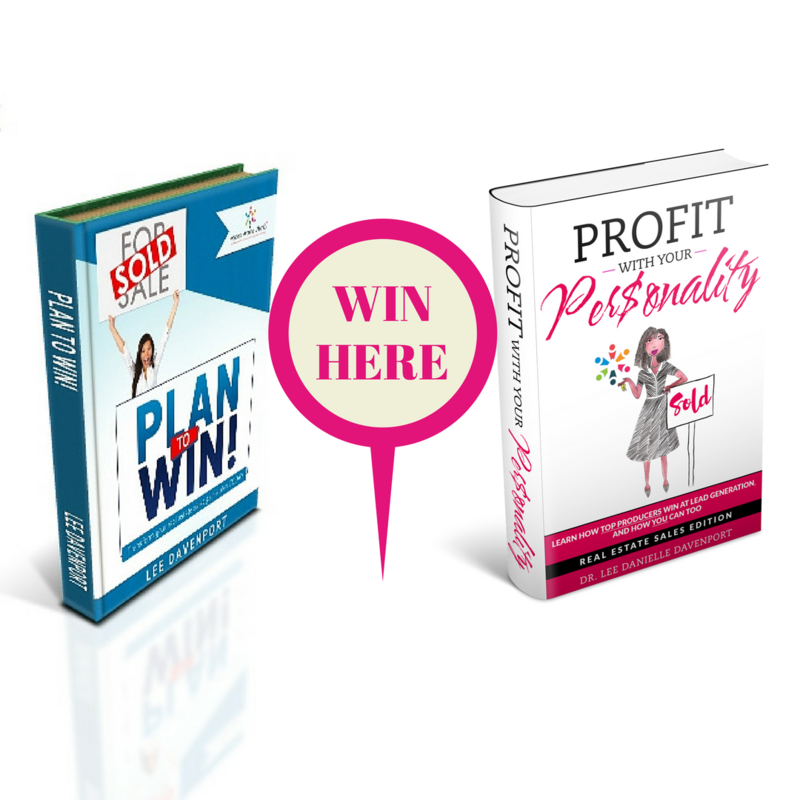 If you already use any of these tips and tools, leave a comment below how they have been working for you. Follow me on Google+ and Facebook for more tips and techniques. Also, if you are a real estate agent or manage agents, learn how to RE|VAMP your business with us today. Here's to your success!